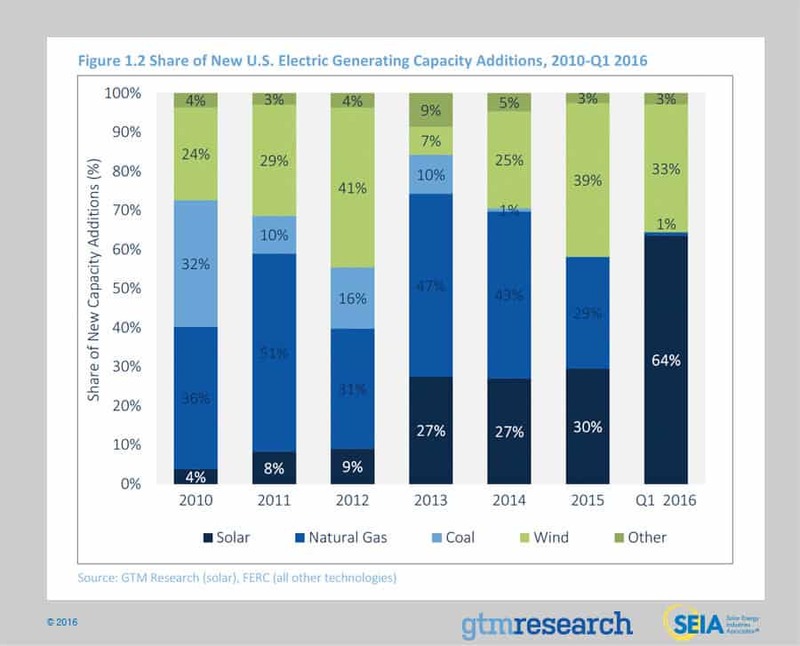 GTM Research and SEIA have changed the naming convention for the U.S. Solar Market Insight report series. From this publication onward, the report title will reference the quarter in which the report is released, as opposed to the most recent quarter in which installation figures are tracked. 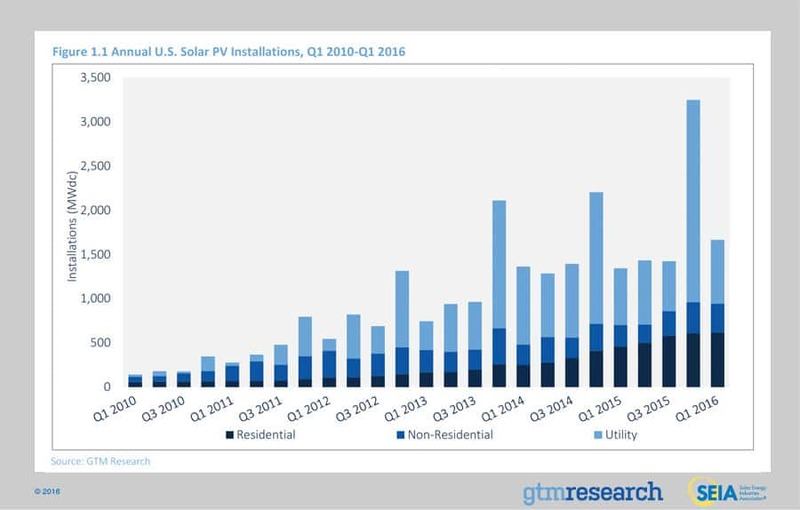 The U.S. installed 1,665 MWdc of solar PV in Q1 2016, increasing 24% over Q1 2015. This quarter is the largest non-Q4 in U.S. the history of the U.S. solar industry. In Q1 2016, the cumulative number of U.S. solar installations brought on-line eclipsed 1 million, representing 27.5 GWdc in operating capacity. In Q1 2016, solar accounted for 64% of all new electric generating capacity brought on-line in the U.S. Residential PV remained relatively flat compared to Q4 2015 due to seasonal effects, but still added well over half a GWdc for the fourth consecutive quarter. For the first time ever, non-residential PV installed more than 300 MWdc in back-to-back quarters. GTM Research forecasts that 14.5 GWdc of new PV installations will come on-line in 2016, up 94% over 2015. Utility PV is expected to drive the majority of demand, accounting for nearly three-fourths of new capacity. There are now more than 1 million operating solar PV installations, representing 27.5 GWdc of operating solar PV capacity in the U.S. Putting this figure in historical context, 1 million installations is that much more of an impressive feat, given that more than 90% of these projects came on-line during this decade alone. When accounting for all projects (both distributed and centralized), solar continues to drive a growing portion of new electric generating capacity additions. Last year, solar exceeded natural-gas capacity additions for the first time on an annual basis. Building off that momentum, solar accounted for 64% of all new electric generating capacity installed in the U.S. in Q1 2016, ranking as the largest driver of capacity additions across all fuel types. Looking ahead, the extension of the federal Investment Tax Credit will enable the U.S. solar PV market to become a double-digit-gigawatt annual market not only in 2016, but also through the end of this decade. However, in 2016, the rate at which the U.S. solar PV market grows in each market segment will be impacted by the timing of the recent federal ITC extension, along with the timing of several state-level policy developments that happened in late 2015 and early 2016. Utility PV: Given that the federal ITC extension was ultimately passed by Congress in December 2015, more than 10 GWdc of utility PV has been rushed through the development cycle and is still slated to come on-line this year. At least another 4.5 GWdc of utility PV installations are expected to be nearly or fully finished with construction in Q4 2016, with official commercial operation expected in 2017. The drivers behind where, how and why this spillover happens are explored further in the full version of this report. Non-residential PV: For the non-residential PV market, which has remained flat over the past three years, a rebound in 2016 should stem from new state-level policies established during legislative or regulatory proceedings in early 2016. These include extensions to NEM program capacity limits and the rollout of new non-residential PV incentive programs, particularly for community solar. Residential PV: The timing of net metering reforms in a handful of major state markets will play a role in inflating 2016 growth. Most notably, Nevada’s market has seen a freeze in new rooftop solar sales in response to stark NEM reforms in NV Energy territory. However, more than 20 MWdc still came on-line in Q1 2016 from projects that rushed through the installation process in Q4 2015, with hopes of being grandfathered in under old NEM rules. 2016 finds the U.S. solar market in a period of transition, characterized by shifts in both the drivers and geographic distribution of market demand. A wave of geographic demand diffusion is expected, primarily in the utility PV market. Most notably in the southeast, states where operating solar capacity stands at or below 10 MWdc will increase their capacity by more than tenfold due to inexpensive utility PV power-purchase agreements (PPAs) that reflect the ability of utility-scale solar to both compete with and complement new natural gas plants. Meanwhile, commercial customers’ solar procurement strategies are expanding, with well over 1 GWdc of offsite solar projects in development, from both community solar and offsite utility-scale solar. And finally, the policy landscape for rooftop solar is becoming increasingly fragmented and complicated, with debates over net metering and rate design evolving beyond fixed-charge proposals to multifaceted ones that encompass demand charges, time-of-use rates, and/or value-of-solar tariffs. Amidst these near-term state-level drivers and risks, the extension of the federal Investment Tax Credit will serve as a long-term policy bridge to help transform solar PV into an increasingly mainstream source of power generation in the U.S. electricity market. With the federal ITC extended through 2021, and a “commence-construction” rule added, market participants benefit from federal-level policy visibility through 2023. Building off that policy certainty, as the following figure reveals, U.S. solar is expected to account for more than 6% of operating electric generating capacity by 2021, compared to just 0.3% at the beginning of this decade. With an average growth rate of 11% over the preceding four quarters, the residential PV slowdown in Q1 2016 was a function of both seasonal factors and the inevitable leveling-off of demand after years of persistently robust growth. Though California still accounts for nearly 50% of residential PV this quarter, installations did not grow in Q1 for the first time in a year, with many major state markets experiencing similar trends. Likely attributable to seasonal factors, California’s flat growth in Q1 is unlikely to continue into the rest of the year, as the state will retain its position as the top state market and a significant driver of PV demand. However, volumes in other major state markets that have experienced NEM reform, such as Nevada and Hawaii, will taper throughout the year as non-energized projects make their way through the interconnection queue. Despite declining or flat growth in select major states, growth in some major and emerging state markets helped buoy rooftop PV in Q1. New York’s and Maryland’s rooftop PV markets both experienced over 25% growth this quarter, while Texas and Utah both saw impressive growth in their own right. Going forward, we expect a number of smaller state markets to pick up steam and balance out the demand slowdown seen in major states. 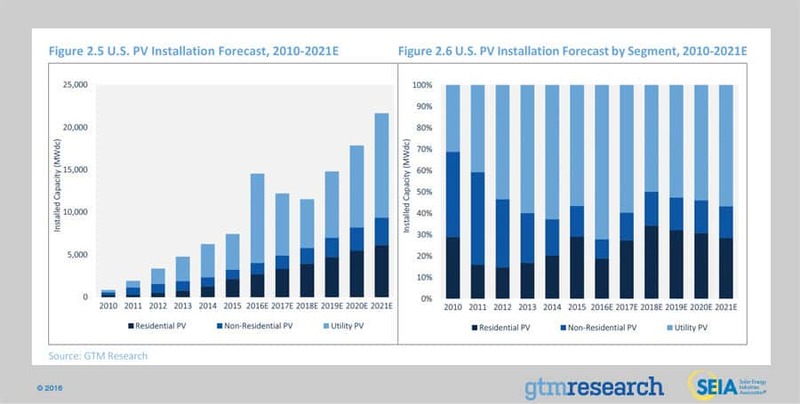 Continuing the trend of 2015, growth in the non-residential PV segment remains constrained. California’s share of the market continues to hover near one-third of the market total, though the state saw its first decline in installations since Q1 2015. Persistent stagnation within the non-residential space stems from development issues specific to particular sub-segments, such as small-scale, unrated commercial and industrial, in addition to a deteriorating incentive environment in many major state markets. On an individual state level, both Massachusetts and Maryland saw notable growth, as recent regulatory developments have provided some short- to medium-term policy stability for commercial development. In total, 20 states experienced growth on a year-over-year basis. Manageable financial penalties: Financial penalties incurred due to interconnection delays are sufficiently low for a developer to spill over a project while maintaining required returns. Voluntary vs. required commercial operation dates: Many projects’ PPAs had voluntary 2016 commercial operation dates that were proposed by the developer, but mandatory 2017 commercial operation dates set forth by the utility. Utility-led spillover: Some utilities have expressed willingness to push a project’s commercial operation date from Q4 2016 to 1H 2017 as long as the developer demonstrates substantial progress toward completion, such as finishing construction before the end of this year. Alternatively, certain procurement programs, such as the California investor-owned utilities’ Renewable Auction Mechanism, have clauses in PPAs that would allow for spillover due to a utility-led interconnection delay. Looking ahead, a couple of key trends that will shape the near-term utility PV market outlook include continued growth of utility PV outside of renewable portfolio standard (RPS) obligations and increased procurement by municipal and cooperative utilities. While only 9 states have 200 MWdc or more operating, 17 states now have 200 MWdc or more in development. This is in part driven by utilities in both major and emerging markets procuring solar as a hedge against natural-gas price volatility. Underlying these geographic demand and procurement trends is the low price environment for utility PV, with recent PPAs being signed at prices between $35/MWh and $50/MWh. We utilize a bottom-up modeling methodology to track and report national average PV system pricing for the major market segments. Though we continue to solicit weighted-average system pricing directly from utility and state incentive programs, we believe this data less accurately reflects the current state of system pricing. Systems utilizing local incentive programs constitute a minority share of the market, and data from these sources often represents pricing quoted well prior to the installation and connection date. 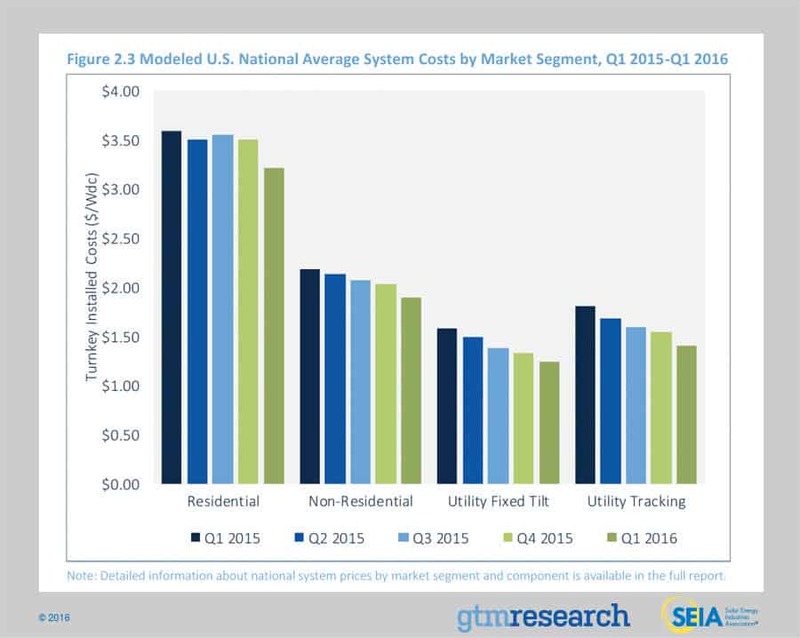 In Q1 2016, overall system pricing fell by up to 8.8%, depending on the market segment, with the largest declines in the utility tracking sector. On a quarterly basis, pricing continues to trend downward across all market segments. After a relatively stagnant 2015, residential system prices fell 8.3% in Q1 2016. This decrease is due to continued hardware cost reductions and an increased focus on tackling soft costs. Price declines of 8.3% and 6.9% also occurred in the non-residential and fixed-tilt utility sectors, respectively. Moreover, as installers and EPCs expand to states with lower labor and regulatory compliance costs (e.g., South Carolina and Indiana), these geographies will have a larger impact on aggregate pricing. In Q1 2016, average pricing for residential rooftop systems landed at $3.21/Wdc, with nearly 63% of costs coming from on-site labor, engineering, permitting and other soft costs. While residential hardware costs fell by over 4% in the past quarter, soft costs have decreased on an industry-average basis of almost 12%. In fact, this quarter has seen the first decrease in residential soft costs since Q4 2014. This was driven by concerted efforts by national and regional installers to lower operational costs and to optimize on-site installation labor. In Q1 2016, the non-residential sector also saw a significant 7% fall in pricing. Within non-residential, hardware costs fell 6% quarter-over-quarter, while soft costs saw a decrease of 9%. Despite this decrease, in Q1 2016 soft costs still accounted for approximately 50% of total system pricing. This reflects many of the challenges of selling and executing projects with multiple stakeholders and project parameters that may vary from sale to sale. Moreover, soft costs can be even higher for projects in regions with strict labor requirements, and particularly in jurisdictions with more stringent permitting and interconnection requirements. Despite the variety of challenges in the non-residential market, engineering, procurement and construction (EPC) providers are successfully reducing their design costs and minimizing overhead. Utility fixed-tilt and tracking projects in Q1 2016 saw an average pricing of $1.24/Wdc and $1.41/Wdc, respectively. Among both fixed-tilt and tracker ground-mount systems, both hardware and soft-cost reductions contributed to lower overall system pricing. While utility system pricing is more tightly clustered than are residential and non-residential systems pricing, state-by-state variation is prevalent. In particular, Texas sees some of the most competitive ground-mount systems pricing. Moreover, the cost premium of tracking systems over fixed-tilt is beginning to shrink. In Q1 2015, tracker systems carried a $0.21/Wdc premium over fixed-tilt systems. However, in Q1 2016, that premium shrunk to $0.17/Wdc. Continued reduction of upfront costs for trackers will spur the increasing share of tracking projects in the utility ground-mount market. Prices in Q1 2016 were driven by seasonally weak downstream demand and component-level inventory and supply availability. For polysilicon, prices fell 2% to $14.17/kg in Q1 2016. While down during the quarter, the level of sequential decline decreased as channel inventory declined. Wafer and cell prices were effectively flat, reaching $0.21/W and $0.33/W, respectively, in Q1 2016. Prices for these components were driven by stable demand and price expectations from buyers. U.S. module prices are largely driven by antidumping and countervailing duties on Chinese suppliers. In July 2015, the U.S. Department of Commerce filed its final review of the import tariffs on Chinese cells into the U.S. market. The final ruling set the cumulative duty at 30.61% for most major suppliers (21.70% for Yingli). During the first quarter, the average delivered price for Chinese modules ranged from $0.61/W on the low side (corresponding to order volumes greater than 10 MW for less established firms) to $0.63/W on the high side (established, bankable firms; order volumes of less than 1 MW). It should be noted that there is some price risk for producers that continue to ship all-Chinese products to the U.S. in 2016 as the tariff on Chinese cells may change again. Further, there is no assurance that the final results will resemble preliminary results (antidumping duties: 4.53% to 11.47%; countervailing duties: 19.62%). In December 2015, Congress passed an omnibus spending bill that included a multiyear extension of the federal Investment Tax Credit. Without question, the extension of the federal ITC ranks as the most important policy development for U.S. solar in almost a decade. 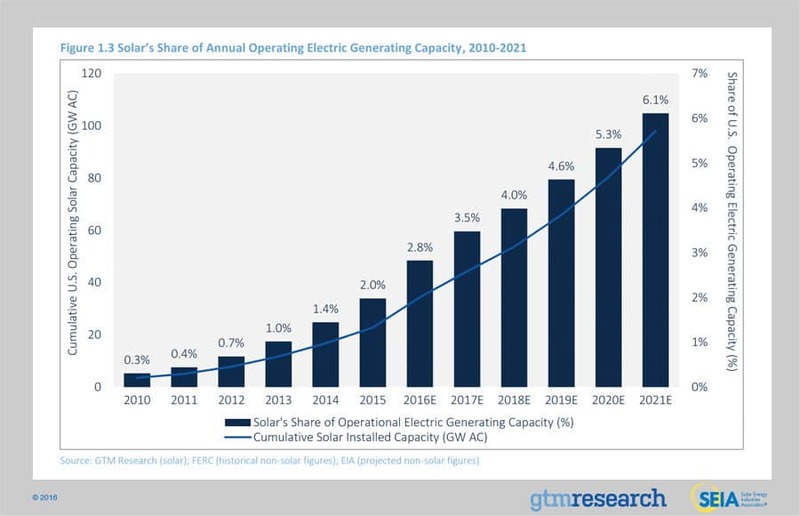 Between this year and the end of the decade, the ITC extension will spur more than 20 GWdc of additional PV capacity, positioning U.S. solar to become a 20 GWdc annual market by 2021. Looking ahead, the federal ITC will remain at 30% through 2019, and then step down to 26% in 2020 and 22% in 2021. In 2022, it will step down to 10% for third-party-owned residential, non-residential, and utility PV projects, while expiring entirely for direct-owned residential PV. Equally important, projects that commence construction but do not interconnect in the years 2019, 2020 and 2021 can qualify for correspondingly larger tax credits if they come on-line by the end of 2023. Given the timing of the federal ITC extension, however, the wheels are already in motion for U.S. solar to benefit in 2016 from a double-digit-gigawatt pipeline of late-stage utility PV projects that rushed through development last year. In turn, we expect another record year for the U.S. PV market in 2016, with installations reaching 14.5 GWdc, a 94% increase over 2015. In 2017, while the residential and non-residential PV markets are both expected to grow year-over-year, the U.S. solar market is still expected to drop on an annual basis due to the aforementioned pull-in of utility PV demand in 2016. However, the year-over-year downturn for utility PV has softened due to a growing number of projects that have pushed out completion dates from this year to 2017. By 2019, U.S. solar is expected to resume year-over-year growth across all market segments. And by 2021, more than half of all states in the U.S. will be 100+ MWdc annual solar markets, bringing cumulative U.S. solar installations above the 100 GWdc mark. 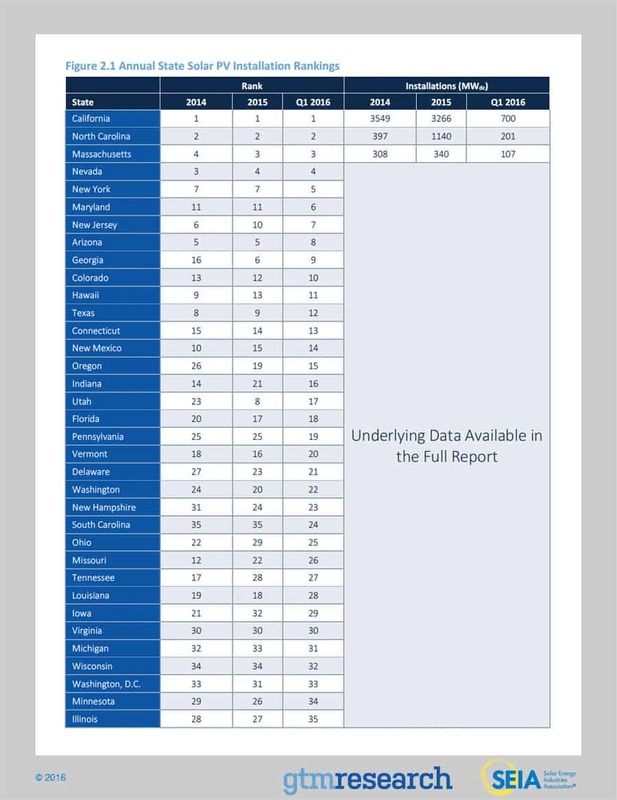 Forecast details by state (34 states plus Washington, D.C.) and market segment through 2021 are available in the full report. U.S. Solar Market Insight® is a quarterly publication of GTM Research and the Solar Energy Industries Association (SEIA)®. Each quarter, we collect granular data on the U.S. solar market from nearly 200 utilities, state agencies, installers and manufacturers. This data provides the backbone of this U.S. Solar Market Insight® report, in which we identify and analyze trends in U.S. solar demand, manufacturing and pricing by state and market segment. We also use this analysis to look forward and forecast demand over the next five years. 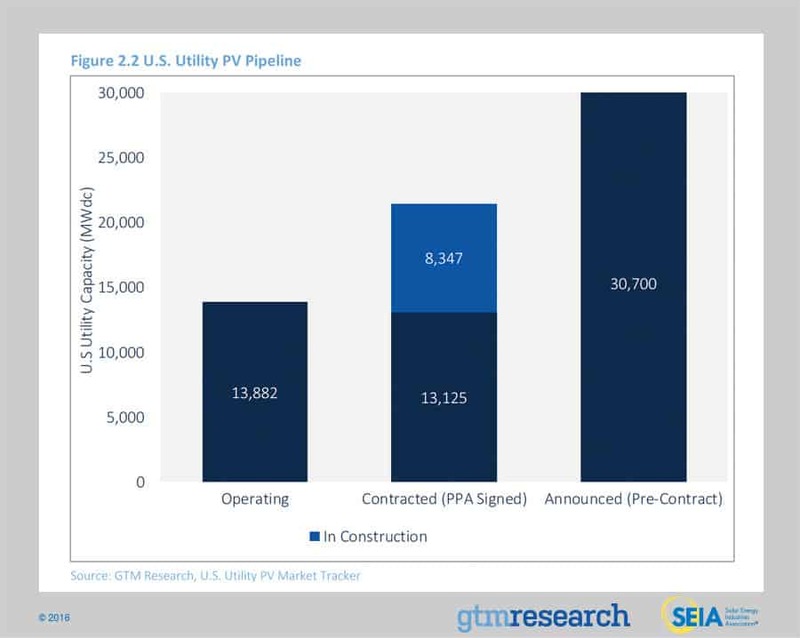 All forecasts are from GTM Research; SEIA does not predict future pricing, bid terms, costs, deployment or supply. All figures are sourced from GTM Research. For more detail on methodology and sources, visit www.gtmresearch.com/solarinsight. Our coverage in the U.S. Solar Market Insight reports includes 34 individual states and Washington, D.C. However, the national totals reported include all 50 states, Washington, D.C., and Puerto Rico. Detailed data and forecasts for 34 states and Washington, D.C. are contained within the full version of this report, available at www.greentechmedia.com/research/ussmi.